This old Bliley crystal oven type TCO-2A was a purchase from the Dayton hamvention fleamarket (for those who don't know, haven't been, etc.... the Dayton hamvention fleamarket is the closest a fanatical homebrewer can come to heaven, without actually departing planet Earth). 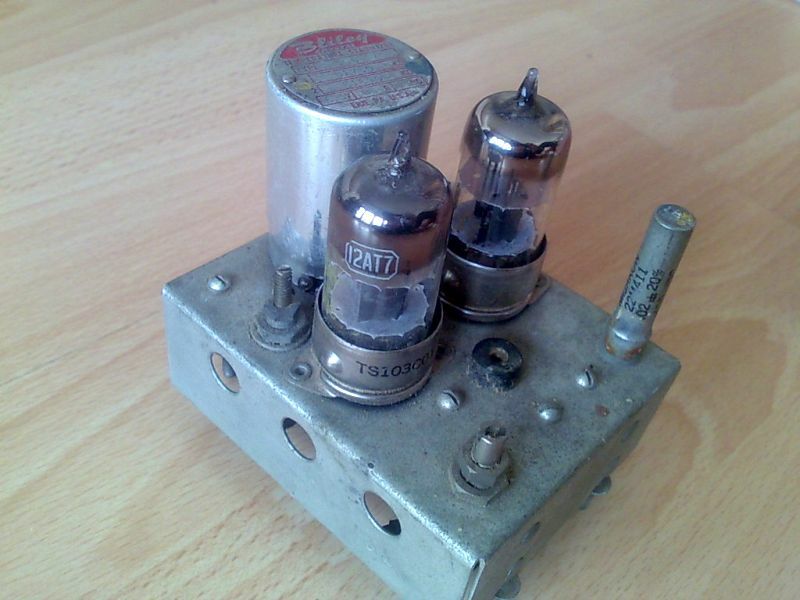 The oven came on a small chassis with two 12AT7 (dual triode) valves, price for the whole thing was just US$1. The oven has a standard octal base and contains two crystals in HC6 holders. 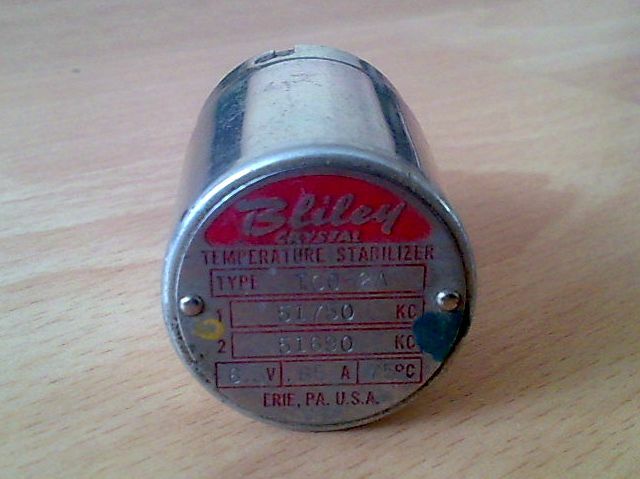 The heater is rated 6.3V 0.85A and claims a temperature of 75C. See the photos below of the chassis and the oven, and even the oven with its can removed. 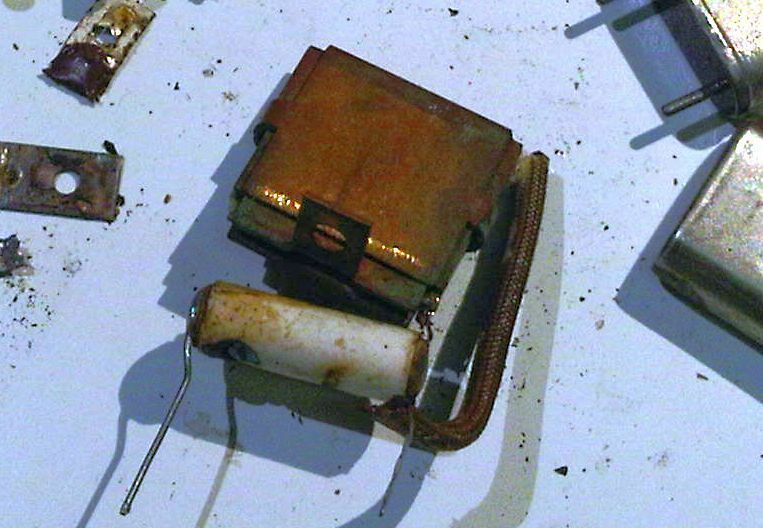 The inside of the can is lined with some kind of cork material for thermal insulation. Click the photos for larger images! A year or two elapsed, in the blink of an eye as is customary, before it was time to look at this oven again. I found a little data on the internet on this oven, at NNN. The relevant section is shown below (click for larger image). Aside from a little data which I already knew (it is printed on the label at the top of the can), the very useful additional piece of information here, is the oven connections diagram seen here to the right. The resolution is rather limited but you can see the general idea. 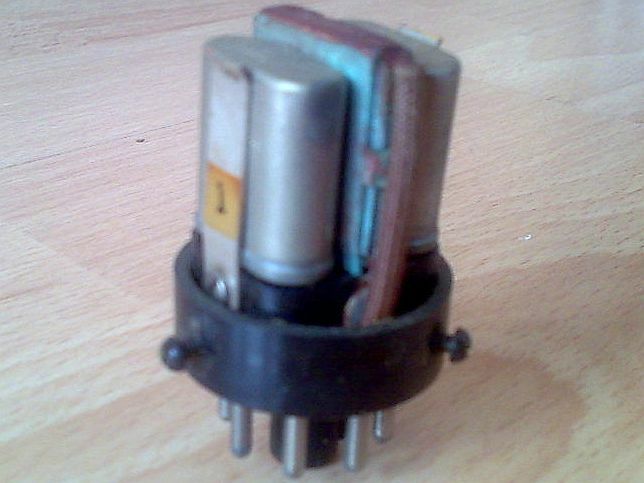 The thing that looks like a diode is in reality supposed to be the thermostat. The diagram shows where the voltage for the heater should be connected, and where you can connect a pilot light, which is supposed to come on when the oven is switched on by the thermostat. I wasn't able to measure anything with a DVM between the pins that approximated the allegations of the diagram. I could measure a few ohms, seeming not inconsistent with a heater rated 6.3V 0.85A, between pins 5 and 7. Connecting 6.3V for some minutes did result in the can getting hot (very) but there was no indication of any thermostatic action or pilot lamp activity etc. Recognising that it would potentially be an unsuccessful, one-way, destructive process, I realised it needed opening up and some repair. The following photos (click for larger versions) show the dismtantled oven components and a close-up of the heater itself, which is sandwiched between a copper plate, between the crystals. The thermostat is the white cylindrical thing attached to the heater. 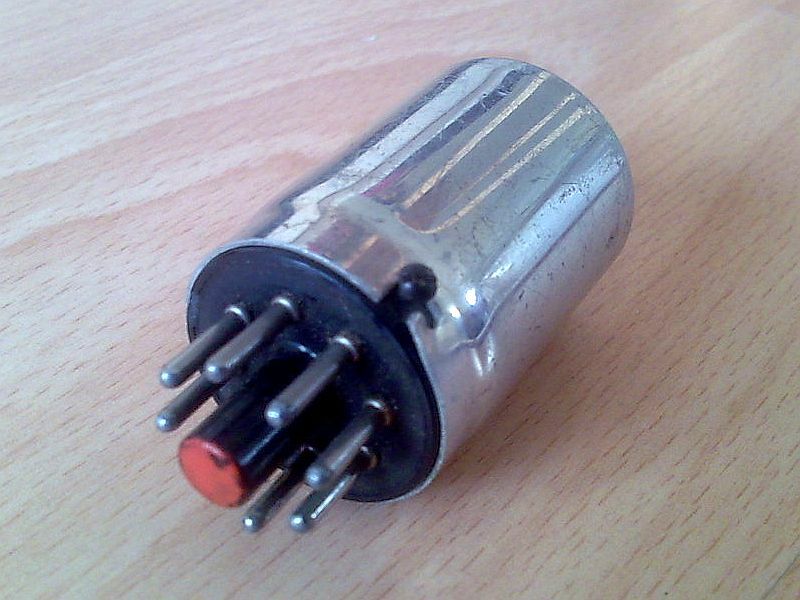 It has a copper screw which presumably sets the temperature. 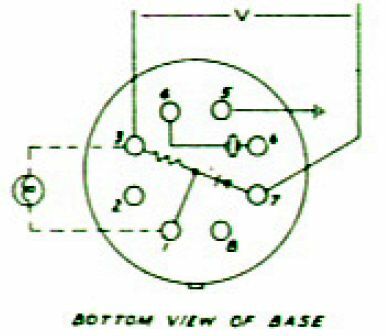 Some considerable force was required to prise the lower parts of the assembly from the octal base, so the exact cause of the fault was indeterminable. I assumed that somewhere underneath the crystal sockets, something had snapped, corroded, broken, shorted, or some combination of these. I worked out how to put it back together, with connections complying with the wiring diagram (left photo below). The HC6 crystals were snipped open. Inside one I put a modern HC49 crystal on 5.0688MHz; in the other a tiny PCB containing a TMP36 temperature sensor (above right). Now when power is applied and a pilot lamp connected, the light stays on for some minutes, then goes off for a minute when the oven has reached full temperature, and thereafter flashes intermittently to maintain the target temperature. So a successful repair! After some decades of inactivity, it all seems to work as it should. Now to make some measurements, again the Arduino frequency-counting data-logger project seems to be most useful. The chart below shows the temperature inside the oven, as measured using the TMP36 temperature sensor (RED line). At the same time, I measured the 6.3V at the pilot lamp, this is the BLUE line at the bottom. I was extremely impressed by this result. Note the initial overshoot. 3 minutes of heating and the temperature shoots way past 75C. I think it takes time for the various internal parts of the oven to reach thermal equilibrium and so the crystals, being pushed against the heater element, reach and pass 75C before the thermostat realises and closes off the power. After switching off, it takes another 30 minutes or so to return to room temperature. In this close-in zoom you can see the variation over only +/- 1C or so. It's actually not bad, considering this is just a harsh on/off thermostat-regulated, decades-old device. Note that the resolution of the temperature measurement is approximately 0.5C, measurements are every 2 seconds, and there is no averaging used here. Now for some frequency measurements! 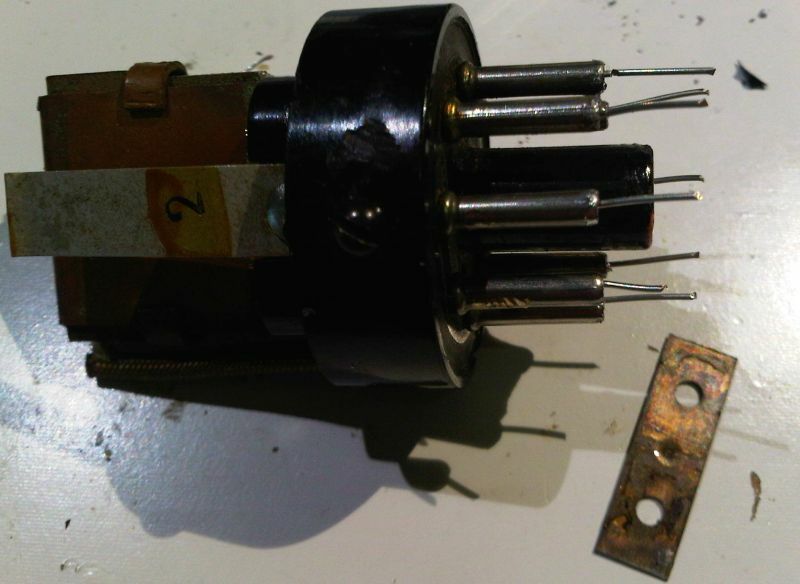 In this case I am using a Z63 octal pentode with 150V regulated supply, in a Pierce oscillator configuration. 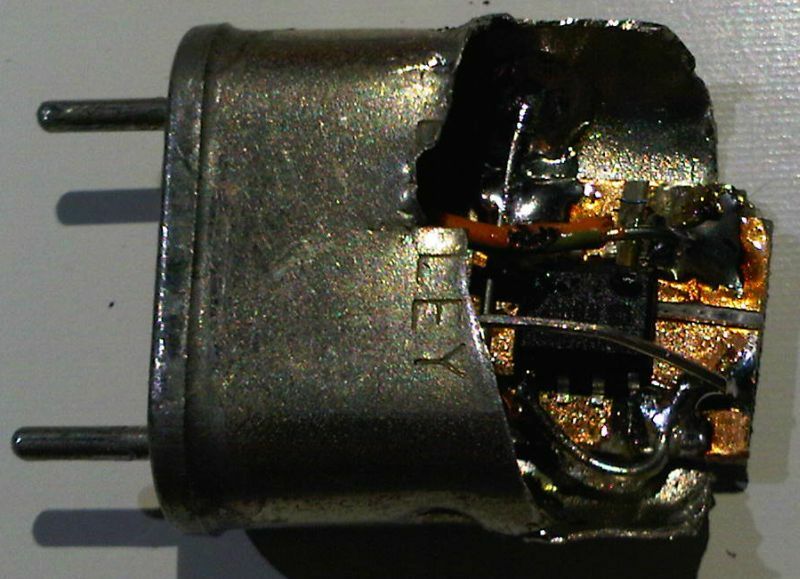 The crystal is 5.0688MHz and there is a 220pF capacitor to ground, to pull the frequency down below the IF filter passband, as this is a BFO. The first chart shows the temperature vs time again for this measurement run, which lasted 1 hour 13 minutes. Now the temperature (BLUE line) and frequency (RED line) plotted together. The frequency changes by almost 180Hz when the temperature goes up to 90C! Close-in chart of the frequency ripple when the temperature of the oven is stabilised. Note that the resolution of frequency measurements is 1Hz, measurements are logged every 2 seconds, and no averaging is used here. The frequency ranges between 77Hz and 85Hz shift from the room temperature frequency. One can say that the oven holds it within +/-4Hz. From the temperature and frequency data, I could extract the following curve of frequency shift vs temperature. The BLUE line is with the crystal on its own in the oven. These kinds of ovens were designed to be used with crystals having a frequency characteristic curve with temperature, such that the curve would have been very flat at 75C. However in my case, it's just a cheap modern 5.0688MHz crystal, and apparently its curve is rather flat around room temperature or slightly above. 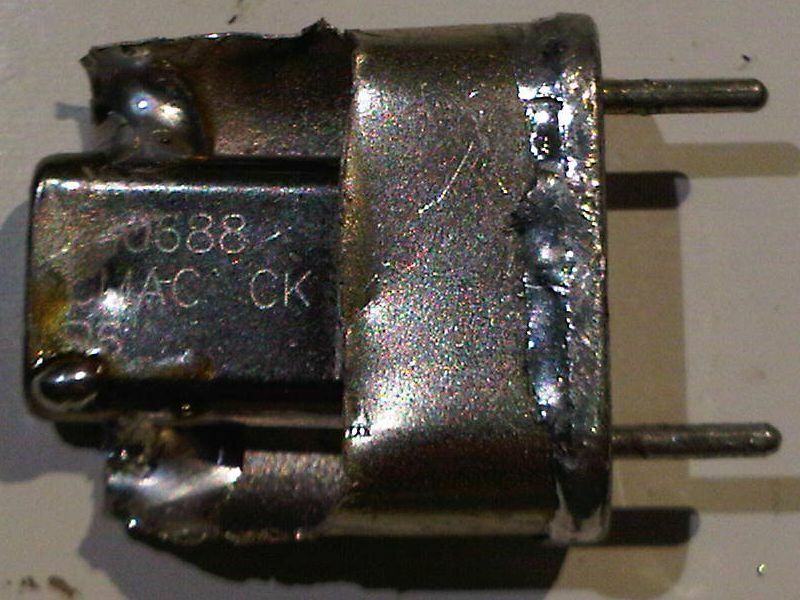 The RED line shows what happened when I put the 220pF silver mica capacitor INSIDE the oven along with the crystal. 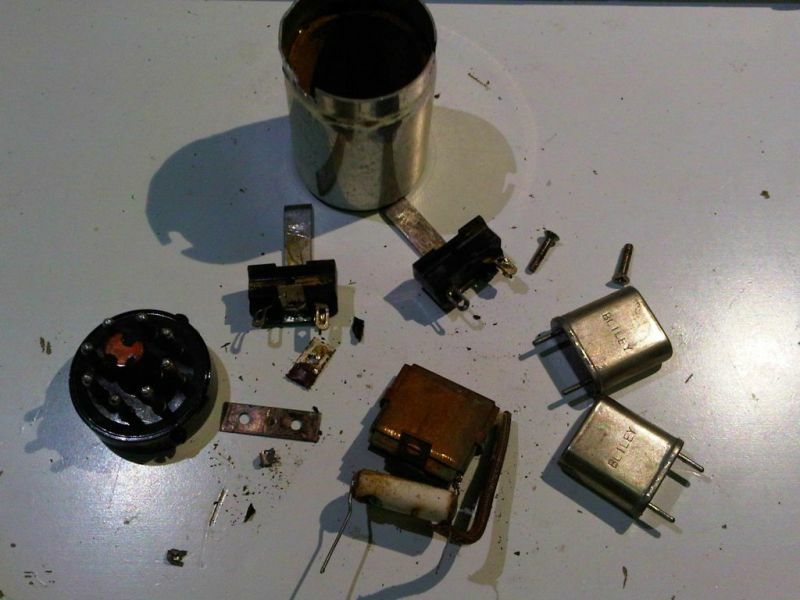 Silver mica capacitors have a slight positive temperature coefficient. As the temperature increases, the capacitance increases too, and in this circuit that will drag the frequency down. This will tend to cancel some of the upwards drift tendency of the crystal. This is what is seen in the RED line. The chart below shows a closer view of the region from 30-55C for both curves. It can be seen that the effect of the inclusion of the slightly positive temperature coefficient capacitor, is to shift the flat part of the curve upwards to around 40C. If I could find a sufficiently positive temperature coefficient capacitor, then I could perhaps shift the flat part of the curve all the way up to 75C, and hence have an extremely stable crystal oscillator with very little frequency ripple - much less than the +/-4Hz of the crystal in its raw state.